"Chinese Air Force" redirects here. For the air force of the Republic of China, see Republic of China Air Force. For other air forces associated with that name, see Chinese Air Force (disambiguation). The People's Liberation Army Air Force (PLAAF) is the aerial warfare service branch of the People's Liberation Army, the armed forces of the People's Republic of China. 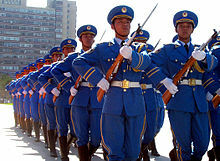 The PLAAF was officially established on 11 November 1949. As of 2014, the PLAAF has a strength of around 398,000 personnel and is the largest air force in Asia. The PLA's first organized air unit, was formed in July 1949 at Beijing Nanyuan Airport. It consisted of six P-51s, two Mosquitoes, and two PT-19s. On 25 October 1949, Liu Yalou was appointed as the chief of air force in the People's Liberation Army. By 11 November, the air force command was officially formed from the headquarters of Liu Yalou's 14th bingtuan (which Witson translates as "Army"). Much Soviet assistance was received to help the process along. The PLAAF fought the Korean War in Soviet-built Mikoyan-Gurevich MiG-15s, known as the J-2 in Chinese service, with training from Soviet instructors. The war also brought Soviet assistance for the indigenous aircraft industry. The Shenyang Aircraft Corporation built the two-seat MiG-15UTI trainer as the JJ-2, and during the war manufactured various components to maintain the Soviet-built fighters. By 1956 the People's Republic was assembling copies of MiG-15s and eight years later was producing both the Shenyang J-5 (MiG-17) and the Shenyang J-6 (MiG-19) under license. The 1960s were a difficult time for the PLAAF. The withdrawal of Soviet aid due to the Sino-Soviet split, and the prioritization of the missile and nuclear weapon programs, crippled the industry, which markedly declined through 1963. A recovery began around 1965 as J-2s, J-5s, and some J-6s were provided to North Vietnam during the Vietnam War. Development of the Shenyang J-8, China's first indigenous fighter, was also initiated during the 1960s. The PLA Air Force underwent reorganization and streamlining as part of the reduction in force begun in 1985. Before the 1985 reorganization, the Air Force reportedly had four branches: air defense, ground attack, bombing, and independent air regiments. In peacetime the Air Force Directorate, under the supervision of the PLA General Staff Department, controlled the Air Force through headquarters located with, or in communication with, each of the seven military region headquarters. In war, control of the Air Force probably reverted to the regional commanders. In 1987 it was not clear how the reorganization and the incorporation of air support elements into the group armies affected air force organization. The largest Air Force organizational unit was the division, which consisted of 17,000 personnel in three regiments. A typical air defense regiment had three squadrons of three flights; each flight had three or four aircraft. The Air Force also had 220,000 air defense personnel who controlled about 100 surface-to-air missile sites and over 16,000 AA guns. In addition, it had a large number of early-warning, ground-control-intercept, and air-base radars manned by specialized troops organized into at least twenty-two independent regiments. In the 1980s the Air Force made serious efforts to raise the educational level and improve the training of its pilots. Superannuated pilots were retired or assigned to other duties. All new pilots were at least middle-school graduates. The time it took to train a qualified pilot capable of performing combat missions reportedly was reduced from four or five years to two years. Training emphasized raising technical and tactical skills in individual pilots and participation in combined-arms operations. Flight safety also increased. In 1987 the Air Force had serious technological deficiencies — especially when compared with its principal threat, the Soviet Armed Forces — and had many needs that it could not satisfy. It needed more advanced aircraft, better avionics, electronic countermeasures equipment, more powerful aircraft weaponry, a low-altitude surface-to-air missile, and better controlled antiaircraft artillery guns. Some progress was made in aircraft design with the incorporation of Western avionics into the Chengdu J-7 and Shenyang J-8, the development of refueling capabilities for the B-6D bomber and the A-5 attack fighter, increased aircraft all-weather capabilities, and the production of the HQ-2J high-altitude surface-to-air missile and the C-601 air-to-ship missile. Although the PLAAF received significant support from Western nations in the 1980s when China was seen as a counterweight to Soviet power, this support ended in 1989 as a result of the Chinese crackdown on the Tiananmen protests of 1989 and the later collapse of the Soviet Union in 1991. After the fall of the USSR, the Russian Federation became China's principal arms supplier, to the extent that Chinese economic growth allowed Russia to sustain its aerospace industry. In the late 1980s, the primary mission of the PLAAF was the defense of the mainland, and most aircraft were assigned to this role. A smaller number of ground attack and bomber units were assigned to Air interdiction and possibly close air support, and some bomber units could be used for nuclear delivery. The force had only limited military airlift and aerial reconnaissance capabilities. In the early 1990s, the PLAAF began a program of modernization, motivated by the collapse of the Soviet Union, as well as the possibility of military conflict with the Republic of China and perhaps also involving the United States. This process began with the acquisition of Su-27s in the early 1990s and the development of various fourth-generation aircraft, including the domestic J-10, and the FC-1 . The PLAAF also strove to improve its pilot training and continued to retire obsolete aircraft. This resulted in a reduction of the overall number of aircraft in the PLAAF with a concurrent increase in quality of its air fleet. The 21st century has seen the continuation of the modernization program with China's huge economic growth. It acquired 76 Su-30MKK's from 2000 to 2003, and 24 upgraded Su-30MK2's in 2004. It also produced around 200 J-11s from 2002 onwards and bought 3 batches (at a total of 76) of the Su-27SK/UBK. Production of the J-10 fighter began in 2002 with an estimated 200 aircraft in service currently. The PLAAF also began developing its own tanker aircraft, which it previously lacked, by modifying old H-6 bomber (Tupolev Tu-16). In 2005 it announced plans to buy approximately 30 IL-76 transport planes and 8 Il-78 tanker planes, which would greatly increase its troop airlift capability and offer extended range to many aircraft, though as of 2009 this deal is still on hold. Predictions of the PLAAF's future aircraft fleet indicate that it will consist of large quantities of Chengdu J-10 and Shenyang J-11 as its main force, with J-16 and JH-7A as the PLAAF backbone precision strike fighters. Future stealth fighter projects such as the Chengdu J-20 will be inducted into the air fleet in small numbers, assigned to elite PLAAF selected pilots. The transport fleet will comprise Y-9 medium range transport aircraft, along with the Soviet Ilyushin Il-76, and domestic Y-20 heavy transport aircraft. Its helicopter fleet will comprise Z-20, Z-15 and Mi-17 troop transporters, and the WZ-10 attack helicopter for its ground forces. AWACS/AEW will be refined variants of existing service fleet of KJ-2000 and KJ-200, with UAV/UCAV in early stages of service in the PLAAF. Senior Colonel Wu Guohui has said that the PLAAF is working on a stealth bomber, which some people have called the H-18. According to a 2015 Pentagon report, PLAAF has around 600 modern aircraft. Lt Gen Xu Anxiang, PLAAF Deputy Commander, revealed the PLAAF has a multiphase roadmap for building a strong, modern air force. He said the building of a strategic force by 2020 would integrate aviation, space power, strike and defense capabilities. When this goal is achieved, the PLAAF's fourth-generation equipment like J-20 and Y-20 will become the backbone of the Air Force's arsenal and J-16 along with J-10 would be main stay of PLAAF. Gen Xu also said information-based combat capabilities will be enhanced. The ranks in the Chinese People's Liberation Army Air Force are similar to those of the Chinese Army, formally known as the People's Liberation Army Ground Force, except that those of the PLA Air Force are prefixed by 空军 (Kong Jun) meaning Air Force. See Ranks of the People's Liberation Army or the article on an individual rank for details on the evolution of rank and insignia in the PLAAF. This article primarily covers the existing ranks and insignia. The markings of the PLAAF are a red star in front of a red band, it is very similar to the insignia of the Russian Air Force. The Red star contains the Chinese characters for eight and one, representing August 1, 1927, the date of the formation of the PLA. PLAAF aircraft carry these markings on the fins as well. The August 1st (aerobatic team) is the first PLAAF aerobatics team. It was formed in 1962. Aircraft inventory of PLAAF August 1st Aerobatic Team includes the J-10 and it has previously flown the JJ-5 and J-7. The Sky Wing and Red Falcon air demonstration teams, which operate Nanchang CJ-6 and Hongdu JL-8 respectively, were established in 2011. The Air Force headquarters consists of four departments: Command, Political Work, Logistics, and Materiel, which mirrors the former four general departments of the PLA. Below the headquarters, Theater command air forces (TCAF) direct divisions (Fighter, Attack, Bomber), which in turn direct regiments and squadrons. The PLAAF typically used the system of threes in its organization at Division level and below, i.e. 3 Regiments per Division, 3 Squadrons per Regiment, and so on. The situation is now more fluid, with several divisions (the 5th, 15th, 24th for example) only having two regiments. There are also Independent Regiments within the TCAFs. The PLA Airborne Corps is under direct control of PLAAF Headquarters. Fifty operational air divisions were created from 1950 to 1971. This situation did not change until 1986, when the PLAAF began converting one air division in each of the seven military regions to a division-level transition training base (改装训练基地). Data from other sources seems to indicate that the 16th Air Division became the Shenyang MR Training Base (MRTB), the 17th the Nanjing MRTB (actually Beijing? ), the 46th the Lanzhou MRTB, and the 32nd the Nanjing MRTB (at Rugao). Since then, the PLAAF has gradually reduced the remaining 43 operational air divisions to 29. Scramble.nl, accessed mid 2015, indicates there are at least six regiments of H-6 bombers. All three regiments of the 8th Bomber Division fly the aircraft - the 22nd, 23rd (former 143rd Regt/48th Div), and 24th. Also flying is the 28th Regiment of the 10th Bomber Division (People's Republic of China) and the 107th and 108th Regiments of the 36th Bomber Division. 26th Ftr Div with one regiment previously at Shanghai-Chongming Island; 31st Fighter Division previously with Jinan MR; 35th Ftr Div. For a more comprehensive list, see List of People's Liberation Army Air Force airbases. For a more comprehensive list, see List of active People's Liberation Army aircraft. The People's Liberation Army Air Force operates a large and varied fleet of some 3,010+ aircraft, of which around 2,100 are combat aircraft (fighter, attack and bombers). According to the International Institute for Strategic Studies, PLAAF combat pilots acquire an average of 100-150 flying hours per year. For a list of aircraft no-longer flown by the People's Liberation Army Air Force see; List of historic aircraft of the People's Liberation Army Air Force. ^ a b c d e International Institute for Strategic Studies: The Military Balance 2014, p. 236. ^ "Flightglobal - World Air Forces 2015 (PDF)" (PDF). Flightglobal. Archived (PDF) from the original on 19 December 2014. Retrieved 14 August 2017. ^ Hacket, IISS 2010, pg 403–404. ^ Ken Allen, Chapter 9, "PLA Air Force Organization" Archived 2007-09-29 at the Wayback Machine, The PLA as Organization, ed. James C. Mulvenon and Andrew N.D. Yang (Santa Monica, CA: RAND, 2002), 349. ^ 《中国人民解放军军史》编写组 (2011). 中国人民解放军军史:第四卷. 军事科学出版社. p. 52. ISBN 978-7-80237-427-0. ^ Cliff, Roger; John Fei; Jeff Hagen; Elizabeth Hague; Eric Heginbotham; John Stillion (2011). "Shaking the Heavens and Splitting the Earth: Chinese Air Force Employment Concepts in the 21st Century" (PDF). RAND. p. 36. Archived (PDF) from the original on 17 April 2012. Retrieved 9 June 2012. 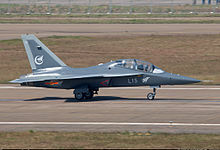 ^ "J-2 (Jian-2 Fighter aircraft 2)". GlobalSecurity.org. 2011-05-03. Archived from the original on 2012-11-04. Retrieved 2011-06-28. ^ a b "A Country Study: China". Country Studies. Library of Congress: 584. Archived from the original on 2017-02-16. Retrieved 2017-08-05. ^ a b "A Country Study: China". Country Studies. Library of Congress: 583. Archived from the original on 2017-02-16. Retrieved 2017-08-05. ^ "Is China's H-18 bomber a joke? asks Duowei". wantchinatimes.com. Want China Times. 13 November 2013. Archived from the original on 13 November 2013. Retrieved 13 November 2013. ^ "Military and Security Developments Involving the People's Republic of China 2015" (PDF). Archived from the original (PDF) on 14 May 2015. ^ "Military Aircraft Insignia of the World - D". Archived from the original on 27 October 2018. Retrieved 25 December 2014. ^ "Roundels of China". Archived from the original on 14 September 2015. Retrieved 25 December 2014. ^ IISS Military Balance 2012, 239–240. ^ Kenneth Allan (2012). "The Organizational Structure of the PLAAF". The Chinese Air Force: Evolving Concepts, Roles, and Capabilities (PDF). National Defense University Press. p. 104. ISBN 978-0-16-091386-0. Archived (PDF) from the original on 2017-07-12. Retrieved 2017-07-29. ^ "Possible Indian Military Scenarios - XII - Page 60 - Bharat Rakshak". forums.bharat-rakshak.com. Archived from the original on 30 July 2017. Retrieved 14 August 2017. ^ a b c "Chinese Air Arms OrBat". www.oja.link. Archived from the original on 30 July 2017. Retrieved 14 August 2017. ^ a b c d e f g h i j k l m n o p q r s t u v w x y z aa ab "World Air Forces 2019". Flightglobal Insight. 2019. Archived from the original on 23 January 2019. Retrieved 4 December 2018. ^ bmpd (2 December 2017). "Китай получил уже 14 истребителей Су-35". ^ "Images reveal China's J-16 jets stepping up introduction into service". ^ "中国已启动第三条歼20战机生产线 年总产量已超40架". Sina Military. Archived from the original on 2017-06-17. Retrieved 2017-06-14.
International Institute for Strategic Studies (2014). Hacket, James (ed.). The Military Balance 2014. Oxfordshire: Routledge. ISBN 978-1-85743-722-5. Wikimedia Commons has media related to Air force of China.